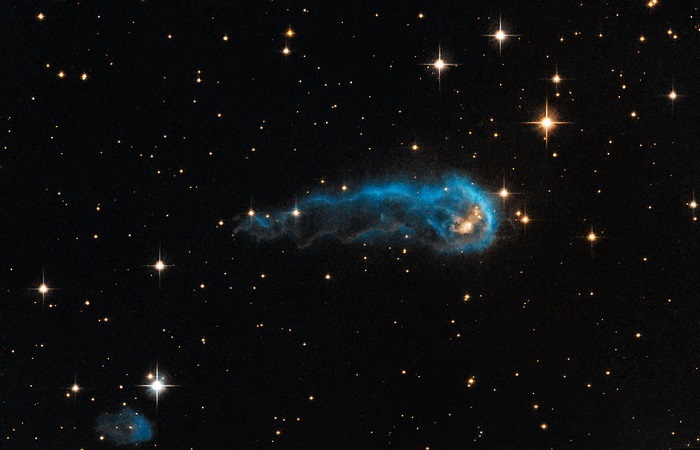 This light-year-long knot of interstellar gas and dust resembles a caterpillar on its way to a feast. But the meat of the story is not only what this cosmic caterpillar eats for lunch, but also what's eating it. Harsh winds from extremely bright stars located 15 light-years away from the knot towards the right edge of the image, are blasting ultraviolet radiation at this "wanna-be" star and sculpting the gas and dust into its long shape. This image is a composite of Hubble Advanced Camera for Surveys (ACS) data taken in green and infrared light in 2006, and ground-based hydrogen data from the Isaac Newton Telescope in 2003, as part of the IPHAS H-alpha survey. The object lies 4500 light-years away in the constellation of Cygnus (The Swan).